From the Beggining of history, many ball related games were played and all rose and fell independently of each other. These games were often non-regulation ran, violent acts of man attempting to administer some entertainment and exercise within their group of co-inhabitants. These games were no doubt rough and often caused much violence due to the lack of regulation and rules. This can be seen completely differently today in modern football. Even though football today was invented from rugby there is a major distinction between the two. 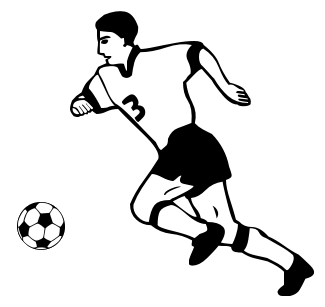 In Football the feet are often used for actions besides just kicking the ball including skills and control such as dribbling. Technical skills in football are often down to the use of other body parts such as the head and chest. Footballs themselves have evolved from the use of organs from animals such as a pigs stomach, to heavy leather balls to the regulation balls used in modern games today. The game of football can be related to rugby as it was where it originated but most of the ancient games had no relation at all to rugby. However it is clear that these old games created skills, methods and techniques that have been passed down through the years and we must acknowledge that today's players would not be the same without the original ancestors of the sport. In the Middles ages Europe was the home for violent games held in towns commonly known as Mob Football where is very surprising to notise the progress of games in this particular period of time and consider the progress of football in regards to violence. The techniques for the game have been around for many centuries. In the year 2002, for the first time in History, Japan held their first World Cup. Internationally, people were unaware that locals had been playing a juggling game called kemari for the past two thousand, three hundred years!! In the 19th Century in England, many sports saw a huge popularity boost including football. This occured mainly due to the industrial revolution which created larger cities and factories thus taking away their traditional country activities.All people from all walks of life started to watch and support their local teams in football on Sundays along side their other commitments such as attending church. These were the early days for FIFA and much was still to be done. Football or Soccer as we know it today made its impact in history during the 1960s were mainstream media and TV coverage gave it the tools it needed to make it more popular than ever before. Aeronautics made it easier to create international matches between teams from other countries as well as the World Cup. Many people view football as a violent and common sport, responsible for a large promotion of hooliganism. This is no doubt since it is one of the only sports where crowds need separating from each other and held in place by security barriers and security staff and take up a huge amount of the authorities and emergency services time. Know Your Football History Now? Great. Want to Learn the Rules? Click here!